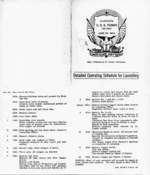 ww2dbaseAfter shakedown training off California, United States, submarine USS Tunny arrived at Pearl Harbor, Hawaii, United States on 12 Dec 1942. She departed Pearl Harbor for her first war patrol in the following month. On 3 Feb 1943, she attacked a Japanese tanker off Hong Kong, hitting her with one torpedo which failed to explode; after nightfall on the same day, however, she attacked another ship and claimed her first sinking, though this was not confirmed. On 8 Feb, she sank Japanese freighter Kusayama Maru off China, which was her first confirmed kill. Her second war patrol would prove to be even more aggressive than her first. Arriving off the island during the night of 27-28 Mar, she waited close to shore until dawn, then followed patrol boats to a Japanese cargo ship, which was attacked with two torpedoes; the stern was blown off, but it was not known whether the ship was destroyed. Later, Commander, Submarine Force, Pacific Fleet, would describe Tunny's second war patrol as belonging "in that exceptional category of one of the outstandingly aggressive patrols of the war"; during this patrol in the Caroline Islands, in addition to sinking transports, she also performed attacks on Japanese aircraft carriers and destroyers, although these attacks caused minor or no damage to the warships. She was awarded the Presidential Unit Citation for her second war patrol. After equally aggressive follow-up war patrols, she received another Presidential Unit Citation for her fifth war patrol, which included an attempted attack on the battleship Musashi in the Palau Islands. In her ninth and final war patrol, she patrolled in the Sea of Japan, though it was not a fruitful one. After the war, she was decommissioned from service in Dec 1945.
ww2dbaseUSS Tunny returned to service in Feb 1952 for the Korean War, but she was in commission only in a reserve status and saw no action. In Mar 1953, she was recommissioned again and was converted to carry guided missiles; reclassified SSG-282, she served as a Regulus missile submarine for the next 12 years, operating out of Port Hueneme, California United States and then out of Hawaii. In May 1965, she was converted back to a standard submarine. In 1966, she was converted to a troop transport and was reclassified APSS-282; she landed troops and gathered intelligence in this capacity during the Vietnam War, participating in operations such as Operation Deckhouse VI (16 Feb to 3 Mar 1967). She was decommissioned for the final time on 28 Jun 1969 and was sunken as a target ship in 1970. 30 Jun 1942 Submarine Tunny was launched, sponsored by Mrs. Frederick G. Crisp. 1 Sep 1942 USS Tunny was commissioned into service with Lieutenant Commander Elton Watters Grenfell in command. 12 Dec 1942 USS Tunny arrived at Pearl Harbor, US Territory of Hawaii. 12 Jan 1943 USS Tunny departed Pearl Harbor, US Territory of Hawaii for her first war patrol. 26 Jan 1943 USS Tunny stalked a Japanese trawler starting at about 0530 hours off the Ryukyu Islands, Japan, firing her deck gun to attack only in the afternoon. The trawler escaped her after sundown. 29 Jan 1943 USS Tunny entered waters off Taiwan. 31 Jan 1943 USS Tunny detected a Japanese freighter off Takao, Taiwan at about 2230 hours. She fired two torpedoes, both of which missed the target, and survived a counterattack with two depth charges. 1 Feb 1943 USS Tunny entered waters off China. 2 Feb 1943 USS Tunny made radar contact with a ship off Hong Kong at 2130 hours. 3 Feb 1943 While stalking a Japanese tanker at dawn, USS Tunny was discovered by the enemy but continued to pursue the target. Under gunfire, she fired multiple volleys of torpedoes at the tanker; one hit, but it failed to explode. After nightfall, she detected another ship at 2005 hours, fired 3 torpedoes, and claimed sinking it. 4 Feb 1943 USS Tunny's crew found a six feet long black and yellow striped snake aboard and disposed of it. Later on the same day, she detected a hospital ship and chose not to take any action. 6 Feb 1943 USS Tunny patrolled off Shantou, China. 7 Feb 1943 USS Tunny patrolled off Shantou, China. 8 Feb 1943 USS Tunny fired two torpedoes at Japanese freighter Kusayama Maru; both torpedoes missed, and the freighter returned fire. The second volley of two torpedoes also missed. The third volley of three torpedoes all scored, sinking the freighter 20 minutes later. This was Tunny's first confirmed kill. 9 Feb 1943 USS Tunny fired torpedoes on a Japanese convoy in the Taiwan Strait, damaging one transport with two torpedoes. 11 Feb 1943 USS Tunny set sail for Midway Atoll. 24 Feb 1943 USS Tunny arrived at Pearl Harbor, US Territory of Hawaii. 18 Mar 1943 USS Tunny departed Pearl Harbor, US Territory of Hawaii for her second war patrol. 27 Mar 1943 USS Tunny reached Wake Island waters. 28 Mar 1943 USS Tunny attacked a Japanese cargo ship off Wake Island at dawn with two torpedoes, blowing off the ship's stern. 31 Mar 1943 USS Tunny reached the Caroline Islands region. 1 Apr 1943 USS Tunny patrolled off North Pass Island and Truk, Caroline Islands. 2 Apr 1943 In the later afternoon, USS Tunny made radar contact with Japanese transport Toyo Maru Number 2 off Alet Island, Caroline Islands. She fired three torpedoes at the distance of 880 meters and observed a hit on the transport before diving to avoid attack by the escorting Momo-class destroyer; depth charges caused minor damage. 3 Apr 1943 USS Tunny set sail for Namonuito, Caroline Islands. 4 Apr 1943 USS Tunny set sail for McLaughlin Bank, Caroline Islands. 7 Apr 1943 USS Tunny attacked transport Kosei Maru, hitting her with two torpedoes. An Akatsuki-class destroyer counterattacked with depth charges, causing no damage. 8 Apr 1943 USS Tunny patrolled north of West Fayu Island, Caroline Islands. Toward the end of the day she received orders to sail for waters southwest of Truk to intercept a Japanese fleet of unknown composition. 9 Apr 1943 USS Tunny made contact with a Japanese fleet off Truk, Caroline Islands at 2228 hours. She fired four torpedoes at the fleet, which now she realized was an aircraft carrier force, observing multiple hits. She then fired an additional six torpedoes before diving; the subsequent depth charge counterattack caused little damage. Later study of Japanese records revealed that the attacks caused only minor damage on the Japanese force as the torpedoes were detonated prematurely. 11 Apr 1943 USS Tunny was observed by a Japanese ship 40 kilometers off of Truk, Caroline Islands, but there was no subsequent attack. Early in the afternoon, she intercepted Japanese submarine I-9; she fired three forward torpedoes, and the Japanese submarines fired two; all torpedoes missed. Japanese aircraft arrived to hunt USS Tunny, but the bombs dropped caused no damage. USS Tunny would remain submerged until sundown. After dark, while on the surface, she made radar contact with a Japanese destroyer; as she moved to attack, the destroyer also detected her, attacking with nine depth charges; Tunny would remain submerged for hours to escape the attack. 15 Apr 1943 USS Tunny set sail for Saipan, Mariana Islands. 25 May 1943 USS Tunny departed Pearl Harbor, US Territory of Hawaii for her third war patrol. 27 May 1943 USS Tunny refueled at Johnston Island, United States. 31 May 1943 USS Tunny was attacked by a Japanese aircraft, incurring minor damage that was repaired at sea later in the day. 6 Jun 1943 USS Tunny arrived off Truk, Caroline Islands. 7 Jun 1943 USS Tunny was attacked by a Japanese float biplane and later by a destroyer; none caused any damage. 14 Jun 1943 USS Tunny attacked a Japanese convoy east of Murilo Island, Marshall Islands. As she moved into position to attack the three transports, the two escorting destroyers detected her and attacked with 4-inch shells. She dove but maintain her course into attack position, firing four torpedoes at a range of 3,100 meters and claiming three hits. 26 Jun 1943 USS Tunny performed photographic reconnaissance at Saipan Harbor and Tinian Channel in the Mariana Islands. 28 Jun 1943 USS Tunny fired three torpedoes at a Japanese gunboat and dove to escape depth charge attacks from a nearby anti-submarine trawler. She observed two explosions. 4 Jul 1943 USS Tunny, while off Guam, Mariana Islands, received orders to sail to Johnston Island, US Territory of Hawaii. 11 Jul 1943 USS Tunny refueled at Johnston Island, United States. 14 Jul 1943 USS Tunny arrived at Pearl Harbor, US Territory of Hawaii, ending her third war patrol. 5 Aug 1943 USS Tunny departed Pearl Harbor, US Territory of Hawaii for her fourth war patrol. 18 Aug 1943 USS Tunny sighted Pagan and Alamagan in the Mariana Islands. 22 Aug 1943 USS Tunny reached Palau Islands. 24 Aug 1943 USS Tunny detected a 6-ship Japanese convoy near the Toagel Mlungui Pass in the Palau Islands early in the morning and stalked the convoy for the remainder of the day. 25 Aug 1943 USS Tunny attacked a 6-ship Japanese convoy with five torpedoes at 0140 hours and another six torpedoes at dawn; the subsequent depth charge attack caused no damage. She surfaced at noon and found that the convoy had already departed the area. 26 Aug 1943 USS Tunny attacked two Japanese transports with five torpedoes near Toagel Mlungui Pass in the Palau Islands at mid-morning. The subsequent depth charge attack caused a fire in the maneuvering room, causing a momentary loss of power and later causing the submarine to dive uncontrollably. In the early evening she surfaced for repairs, which would last for two days. 29 Aug 1943 USS Tunny completed temporary repairs at sea in the Palau Islands and set sail for home. 8 Sep 1943 USS Tunny arrived at Pearl Harbor, US Territory of Hawaii, ending her fourth war patrol. 11 Sep 1943 USS Tunny departed Pearl Harbor, US Territory of Hawaii. 17 Sep 1943 USS Tunny arrived at Hunters Point Naval Shipyard, San Francisco, California, United States. 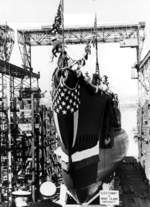 2 Feb 1944 USS Tunny completed her repairs at Hunters Point Naval Shipyard, San Francisco, California, United States. 27 Feb 1944 USS Tunny departed Pearl Harbor, US Territory of Hawaii for her fifth war patrol. 15 Mar 1944 USS Tunny arrived in the Palau Islands. 20 Mar 1944 A Japanese aircraft attacked USS Tunny with eight light bombs near Toagel Mlungui Pass in the Palau Islands, causing no damage. 22 Mar 1944 USS Tunny detected a large Japanese convoy near Toagel Mlungui Pass in the Palau Islands. She fired six torpedoes toward 2 transports and observed hits on both. She then fired four torpedoes toward an escorting destroyer, scoring no hits, before diving. She endured a 4-hour counterattack which consisted of 87 depth charges. Later in the day she surfaced and observed debris and an oil slick. 23 Mar 1944 USS Tunny made radar contact with Japanese submarine I-42 off Angaur Island, Palau Islands. At 2324, Tunny lauched four torpedoes at the range of 1,700 meters, hitting and sinking the Japanese submarine. 29 Mar 1944 USS Tunny observed a large number of small vessels leaving Malakal Island in the Palau Islands in the morning but did not attack. In the afternoon, she observed the arrival of battleship Musashi and other warships; Tunny fired six bow torpedoes at Musashi but failed to hit her. She endured a 38-depth charge counterattack. Later that night, she caught up with the force and damaged Musashi with another torpedo attack. 30 Mar 1944 USS Tunny performed lifeguard duties in the Palau Islands for airmen of the Fifth Fleet. Shortly after noon, she was mistaken for a Japanese submarine and was attacked, causing some damage. 2 Apr 1944 USS Tunny departed Palau Islands. 7 Apr 1944 USS Tunny arrived at Milne Bay, New Guinea. 11 Apr 1944 USS Tunny arrived in Brisbane, Australia, ending her fifth war patrol. 29 Apr 1944 USS Tunny departed Brisbane, Australia for her sixth war patrol. 11 May 1944 USS Tunny arrived in the Mariana Islands. 17 May 1944 USS Tunny received reports of a Japanese convoy from USS Sand Lance and intercepted the 3-ship and 3-destroyer convoy just after sunset in the Mariana Islands. She launched three torpedoes each against two cargo ships, sinking Nichiwa Maru. She endured a counterattack consisted of 81 depth charges, suffering no damage. 8 Jun 1944 USS Tunny made rendezvous with USS Pilotfish and USS Pintado and formed a wolfpack; the group was nicknamed Blair Blasters. 14 Jun 1944 USS Tunny passed through Balintang Channel, Philippine Islands. 15 Jun 1944 USS Tunny sighted Luzon, Philippine Islands. 16 Jun 1944 USS Tunny sank a small sampan with gunfire in the Philippine Islands. 22 Jun 1944 USS Tunny set sail for home from the Philippine Sea. 4 Aug 1944 USS Tunny departed Pearl Harbor, US Territory of Hawaii for her seventh war patrol with the wolfpack "Ed's Eradicators". 25 Aug 1944 USS Tunny arrived in the South China Sea. 31 Aug 1944 While attacking a Japanese convoy in the South China Sea with other submarines of her wolfpack, USS Tunny was attacked by gunfire and depth charges. Tunny did not fire any torpedoes. 1 Sep 1944 A Japanese aircraft attacked USS Tunny with four bombs, the first two of which caused a leak in a vent riser, among other damage. Her commanding officer decided to end the patrol early to receive repairs. 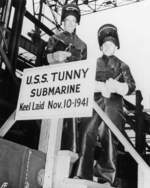 2 Sep 1944 USS Tunny surfaced late at night and set sail for home. 17 Sep 1944 USS Tunny arrived at Pearl Harbor, US Territory of Hawaii, ending her seventh war patrol. 20 Sep 1944 USS Tunny departed Pearl Harbor, US Territory of Hawaii. 26 Sep 1944 USS Tunny arrived at Hunters Point Naval Shipyard, San Francisco, United States. 3 Feb 1945 USS Tunny departed Pearl Harbor, US Territory of Hawaii for her eighth war patrol. 14 Feb 1945 USS Tunny arrived at Tanapag Harbor, Saipan, Mariana Islands and was moored to submarine tender Fulton for repairs. 5 Mar 1945 USS Tunny departed Saipan, Mariana Islands. 13 Mar 1945 USS Tunny conducted a special reconnaissance mission off the Ryukyu Islands in preparation of the invasion of Okinawa, Japan. 14 Mar 1945 USS Tunny placed over 230 mines in waters in the Ryukyu Islands, Japan. 15 Mar 1945 USS Tunny departed Ryukyu Islands, Japan. 18 Mar 1945 USS Tunny detected a Japanese convoy but she failed to gain favorable attack positions. 23 Mar 1945 USS Tunny began performing lifeguard duties off Okinawa, Japan. 1 Apr 1945 USS Tunny completed her lifeguard duties off Okinawa, Japan and set sail for US Territory of Hawaii via Midway Atoll. 14 Apr 1945 USS Tunny arrived at Pearl Harbor, US Territory of Hawaii, ending her eighth war patrol. 14 May 1945 USS Tunny departed Pearl Harbor, US Territory of Hawaii for her ninth war patrol. 28 May 1945 USS Tunny departed Guam, Mariana Islands. 2 Jun 1945 USS Tunny arrived in the Ryukyu Islands, Japan. 4 Jun 1945 USS Tunny arrived off Kyushu, Japan. 5 Jun 1945 USS Tunny passed through the Korea Strait. 9 Jun 1945 USS Tunny attacked a cargo vessel in the Sea of Japan; the torpedo hit but failed to explode. 12 Jun 1945 USS Tunny patrolled immediately off the coast of Etomo Ko, Honshu, Japan. She was detected by search lights and withdrew out to sea. 16 Jun 1945 USS Tunny sighted life rafts from a Japanese ship that was sunk by USS Bonefish; from the survivors she captured a chief petty officer for interrogation. 17 Jun 1945 USS Tunny was attacked by Japanese aircraft in the Sea of Japan. 19 Jun 1945 USS Tunny came across a Japanese cargo ship but was not able to attack due to shallow coastal waters. 23 Jun 1945 USS Tunny made rendezvous with USS Skate in the Sea of Japan. 6 Jul 1945 USS Tunny arrived at Pearl Harbor, US Territory of Hawaii, ending her ninth and final war patrol. 28 Feb 1952 USS Tunny was recommissioned into service. 30 Apr 1952 USS Tunny was decommissioned from service. 6 Mar 1953 USS Tunny was recommissioned into service. 1 Jan 1968 USS Tunny was reclassified LPSS-282. 28 Jun 1969 USS Tunny was decommissioned from service. 30 Jun 1969 USS Tunny was struck from the US Naval Registrar. 19 Jun 1970 USS Tunny was sunk as a target ship.